For many years preachers of the Gospel had a reputation for “hellfire and brimstone sermons” designed to scare people into salvation. While that kind of preaching is more rare these days (perhaps too rare? ), one wonders if fear should not still play a role in conversion. We would all like to think we respond to Jesus Christ solely out of love for Him, but even then there is an element of eternal self preservation involved. Let’s take a look at what role, if any, fear should play in conversion. My thesis here is that yes, fear should play a role, at least initially, in conversion. For it is only when a sinner sees his helplessly position before the Judge of the Universe that he or she is moved to ask in utter despair, “what must I do to be saved?” That moment is called conviction, and it can only be brought about by a sinner accurately seeing the inevitable doom that awaits him unless someone can do something to save him. And I would even say that without conviction of sin and the realization of helplessness before God, the Gospel will not be the “good news” of salvation through the atonement by the blood of Christ that it is supposed to be. This all sounds good, but are there scriptural examples that will bear this out? Glad you asked! This “cut to the heart” is way more than feeling bad about what had happened, as if it had all been a big misunderstanding. They had been looking forward to the coming of Messiah for thousands of years, and when He came, they had murdered Him. Just a minute before, Peter had applied an Old Testament passage to Jesus and said, “Till I make Your enemies Your footstool.” ’ (v.35) This was not a picture of a king with an ottoman in from of his padded chair. This was a picture of someone with their foot on the neck of their enemy! It would have hit them suddenly and piercingly that unless they did something, the wrath of God was going to be upon them. It was this conviction of guilt and fear of judgment that prompted the question “men and brethren, what shall we do?” So while fear was not the basis for the entire process, it did play a vital role in getting them to a place where they could view salvation as good news indeed! And chapter 9 starts off with a further window into Saul’s mission in life. 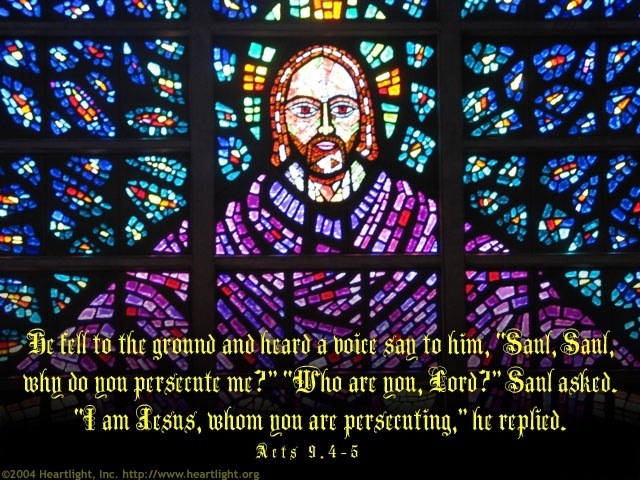 Then Saul, still breathing threats and murder against the disciples of the Lord, went to the high priest (Acts 9:1). This is a man who has made it his mission to eradicate these disciples of Jesus from the face of the earth. He is utterly consumed with what he views as a righteous zeal for God. Then everything changes on the road to Damascus when he has an encounter with Jesus. Once again, a sudden revelation of impending judgment and his utter inability to save himself brought about the needed question of, “Lord, what do You want me to do?”. Well we want to confirm everything in the mouth if two or three witnesses, so lets look at one more – the Philippian jailer in Acts 16. Here we have a man whose very life depended on how well he did his job. Any prisoners that escaped took his life with them. He is there one evening while his two newest prisoners are doing what everyone would do in the innermost depths of a filthy Roman jail – singing praises to God! And not only the jailer, but the other prisoners were listening, too. Then two miracles happen! There is an earthquake that loosens everyone’s chains and opens all of the doors, and also no prisoners left the building in spite of their newfound freedom! It is dark (about midnight) so the jailer decides to save himself torture and the execution of him and his family by drawing his sword to take his own life. His thought may have been that there would be less shame for his family if it looked like he had died trying to prevent the escape. Suddenly Paul cries out to stop him! But Paul called with a loud voice, saying, “Do yourself no harm, for we are all here.” Then he called for a light, ran in, and fell down trembling before Paul and Silas. (Acts 16:28, 29). Again we see someone trembling and asking the correct question! The jailer knew that this was nothing short of a miracle, and wanted this God that not only had the power to deliver His servants, but gave them enough joy that they would be singing praises at midnight in utter darkness and filth. There is true benefit in telling the lost about the reality of their predicament outside of the saving work of Christ that has provided a way of escape. We exclude this part of the message at our (and their) peril. Does that mean that every time you preach with conviction of sin in mind and people are “cut to the heart” that they will all be converted to Christ? No, some will still not surrender to the Lordship of Jesus. In Acts 7:54, they were cut to the heart and gnashed their teeth at Stephen, and later killed him. But nevertheless, that does not excuse skipping it either. They may repent, or they may kill you, but that doesn’t excuse changing the message! « When Was Cornelius Born Again?